Northern England was heavily glaciated until 10,000 years ago. More than 10m of ice covered the landscape, with more conventional ‘glacier’ flows of ice following the pre-ordained valleys of the Ipswichian Interglacial that preceded the last phase of our glacial history. We are, appropriately, currently concerned with glacial melting as an indicator of climate change and images of ice melting are widespread. However, there is little attention to how powerful meltwater streams deliver glacially-eroded cobbles, gravels, sands and ‘rock flour (see below) downstream – a prominent feature of the evolution of the Tyne valley. The Tyne has alternating narrow ‘gorge’ sections and wider floodplains where the ice spread and where ice plugs in the gorges dammed up impressive lakes trapping fine clays and creating a diverse post-glacial geology in vertical section, perhaps not always appreciated by gravel resource assessments and planning exploitations lacking geotechnical assessments. The Tyne deposits are not just gravel of commercial size. Exploitation involves sensitive site management to grade the material for the valuable sizes and to manage the ‘waste’, especially finer materials. The river gravel has always been seen as a resource, first locally for farm roads and, after WW2, as a regional resource for post-war building reconstruction. Against all better judgement, licences were granted to extract millions of tonnes of river-bed material (David Archer: ‘Tyne and Tide’, 2003), creating widespread channel change within and beyond the quarried reaches and possibly contributing to the massive decline in the Tyne salmon fishery. Pollution was identified in the lower reaches but gravel extraction was the major damage to habitats in the upper reaches. 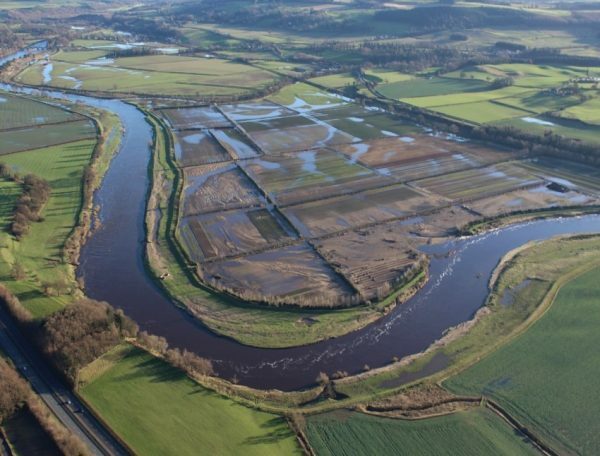 After in-river gravel mining was banned in the early 1960’s, attention in Northumberland moved to the glacio-fluvial floodplain deposits (delivered by big rivers sourced by ice melting). The Caistron site on the Coquet upstream of Morpeth, whilst not Tyne, has plenty of evidence to offer in terms of risk/site/operations management for any possible extraction sites on the Tyne. Additionally, we are seeking site monitoring data from the Haughton Strother site to improve our evidence base. ‘Gravel’ remains a significant resource in a region moving from its earlier dependence on hard-rock resources such as coal, lead, ironstone etc. However, like ‘breakfast cereal’ it has many different sizes and meanings! • Fine sediment management on-site: TRT’s experience with other permitted developments is that this element, crucial to fisheries health, is neglected as ‘a bit of colour down the river’. A disaster of silt pollution on the Tyne or South Tyne might set back the ecological recovery of the river system by decades.